Investigate the fountain of dreams and find out what causes the disappearance of beautiful dreams in Kirby’s Adventure. Find out more by playing this game in the dream land! Kirby's Adventure is an action platforming video game released for the Nintendo Entertainment System (NES) video game console in 1993. In this game, you will control a round and pink creature named Kirby. Kirby can copy his enemies’ powers by absorbing them. Kirby has also the ability to fly around that makes him easy to move from one place to another without falling. Kirby cannot use his copied ability while flying, instead, he can shoot inhaled air in a short distance. There are lots of abilities that Kirby can copy, it includes the fire, spark, laser, ice, burn, sword, and parasol. Kirby's Adventure is an online NES game that you can play at Emulator Online. This free Nintendo game is the United States of America region version for the USA. 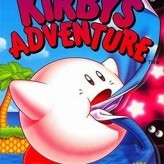 Kirby's Adventure is a single title from the many adventure games, arcade games and kirby games offered for this console. If you enjoyed playing this, then you can find similar games in the nes games category. Kirby's Adventure game is from the various retro games on the site, and there are more games like this, including Kirby's Dream Land, Crash Bandicoot - The Huge Adventure and Kirby's Dream Land 2.